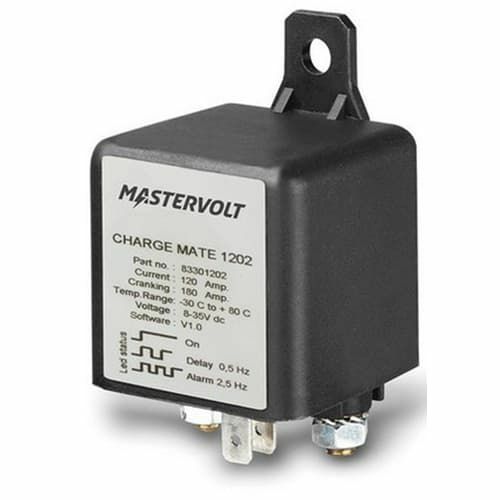 The Mastervolt Charge Mate is an automatic battery relay which connects two battery banks when the voltage rises above a pre-set value for at least 5 seconds allowing these battery banks to be charged simultaneously. When the voltage drops the battery banks will be isolated again. This auto mode is the default setting when no optional remote is connected. An extra mode is Start Assist. In this mode a single push of a button connects the extra bank to the main battery bank for assistance of the main bank by the extra bank. The connection will be disconnected after 30 seconds. The Charge Mate gives accurate information about the connection state of the batteries. An unlit LED indicates an open relay. When one of the batteries is being charged the LED will start to flash slowly to indicate it is counting to 30 seconds before closing the relay. When closed the LED will be lit continuously.